I was thrilled to receive my letter from the Workforce Development Agency regarding my SkillsFuture credit earlier this year. Initially, I thought I was not eligible for it as I was still 24 years old at that time. Thus, when I got the letter, I was really happy. After much consideration on how I would like to use my $500 Skillsfuture credit, I’ve decided to sign up for a Bahasa Melayu / Malay language class which would begin in June. Here is why I’ve decided to learn Bahasa Melayu of all skills and languages available on the Skillsfuture directory. I was first inspired to learn Malay when I read an article on The Straits Times “Speak The National Language” in late 2014. It was written by the Dean of the Lee Kuan Yew School of Public Policy, Kishore Mahbubani. In his essay, he shared that if other races in Singapore learnt Malay, it could help reinforce a sense of common identity among Singaporeans and strengthen our diplomatic communications and economic ties with our neighbouring countries. He lamented that in most countries, most people speak their National Language. However, that is not the case for Singapore. This struck a chord with me. Reflecting on my past 24 years, I am rather embarrassed to admit that I was someone who didn’t have much exposure to the Malay community. This is because I’ve attended Christian/Catholic schools from kindergarten all the way to secondary school. Hence, it was only in JC when I learnt simple Malay words like ayam or rendang. I only started to know more about the Malay culture and lingos when I made quite a few Malay friends through university, social media and work. I believe that as a member of the dominant racial group in Singapore, I should do more to learn about other races. 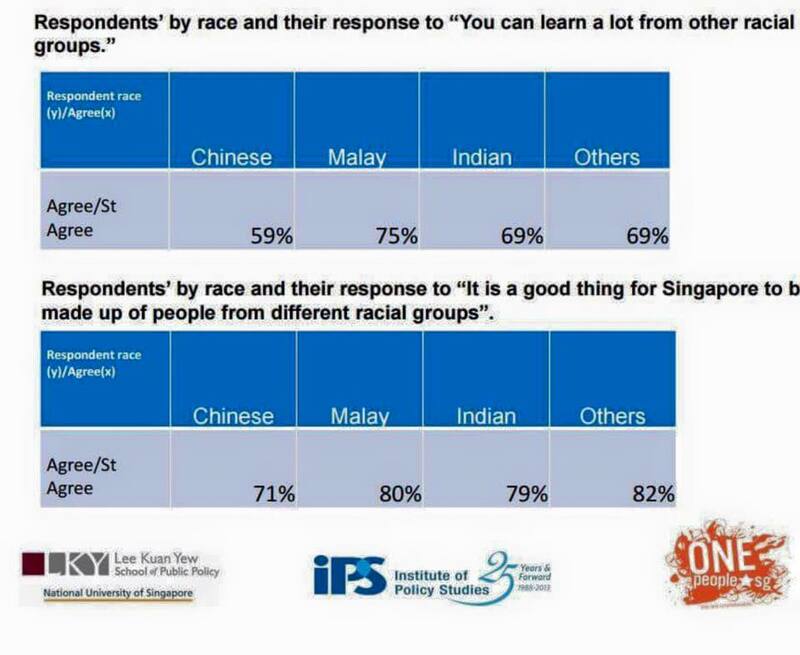 In a 2013 survey by the Institute of Policy Studies and OnePeople.sg titled “Indicators of Racial and Religious Harmony“, researchers found that only 59% of Singaporean Chinese agreed that we can “learn a lot from other racial groups” compared to Malays (75%) and Indians (69%). I feel that it is pretty disturbing that there are Singaporeans who believe that it’s not important to learn about another culture and also think that it’s not good for the country to be made up of different races. I am guessing that is because Singaporean Chinese are the majority and seldom have to adapt to others in social situations and hence many do not see the need to learn about other groups. However, I believe that if more Singaporean Chinese make an effort to understand the culture and languages of the minority, like how they have been adapting to us, we can create “a stronger sense of nationhood that binds together the diverse ethnic communities of into a strong Singaporean Nation”. The second reason why I would like to pick up Bahasa Melayu is due to my career goals. Contrary to popular perception, I am not a full-time blogger except for the period between June – September 2014 when I was going on my graduation trip. In my full-time role, I work in the data and analytics industry. Starting June, I will be working as an Account Manager for the Asia Pacific region at a European big data and social analytics firm. Learning Bahasa Melayu/Indonesia would be pretty useful for my career. Overall, Southeast Asia is facing a technology boom but Indonesia is leading the way. Indonesia’s middle class is expected to double in the next five years, according to Boston Consulting group – and that means huge markets for e-commerce and tech social media companies. In 2015, Indonesia had the highest digital and mobile internet ad growth globally. In 2016, more than one in 10 ad dollars in Indonesia will be spent on digital channels—including mobile—and in 2019, the share will exceed one in four. Even if you’re not in the technology sector, you should also consider learning Bahasa Melayu/Indonesia. Indonesia is also predicted to become may the 7th largest economy in the world in 2030 (It is currently 16th place). It will also rank 4th in consumption power, after India, China and the US. Given the rapid growth of Indonesia and the ASEAN community, when I was looking for jobs in business development and account management, I found that many of the job descriptions mentioned that it would be advantageous if the candidate could speak another Asian language i.e. Bahasa Melayu/Indonesia; Vietnamese; Thai; Cantonese. This is because many companies set up their APAC HQ in Singapore and are targeting clients from neighbouring markets. Since we have many young graduates from Southeast Asian markets coming to Singapore, I hope to also equip myself with a strong grasp of one additional language to better compete with them and stand out in the job market. I am particularly impressed by the educated Malaysian Chinese who can speak four languages fluently – Cantonese/Hokkien; Bahasa Melayu; English and Mandarin. My bestfriend is Singaporean but she grew up in Kuala Lumpur. Hence, she can speak these languages at native competency and it’d definitely be super fun to practice with her. I’ve been pretty active in volunteer work such as grassroots events and house visits. While walking the ground, I’ve noticed that besides vernacular Chinese languages i.e. Teochew, Hokkien, Cantonese, another useful language to know when striking conversations with residents is Bahasa Melayu. I recalled an incident a few weeks ago when I accompanied NCMP Leon Perera during his house visits in East Coast GRC. I was surprised to see that he could speak fluent Malay. I was pretty impressed when I saw how the language complemented his strong people skills and enabled him to connect so well with the residents living in the East through the language. Besides Malay, I am also interested in Cantonese and Spanish. I like Cantonese because it reminds me of Hong Kong and the amazing time I spent there during my journalism internship in Hong Kong. Unfortunately, it is not offered under Skillsfuture currently. I am really looking forward to my first lesson in June and would be sharing my learning journey on Facebook. I hope that my Malay friends won’t laugh at me if I get the words wrong and would offer their support along the way. To browse all available courses which you can use your Skillsfuture Credit on, click here. What would you be keen to learn? Share your thoughts with me below!